homeevent details resources press contact coalition of immokalee workers"
Throughout history, the act of fasting has been a show of faith, a form of political protest, a weapon of the powerless. Virtually all the major faiths include long-held traditions of fasting as a spiritual discipline, a way to seek the holy amidst the temporal, through sacrifice and prayer. Social movements throughout modern times -- from the women's suffrage movement of the early 1900's to Mahatma Gandhi and his use of non-violent protest to challenge British colonial rule -- have also turned to fasting when other forms of protest have failed to produce change. 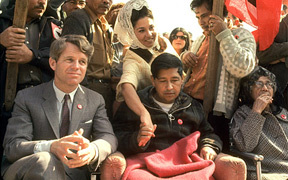 US farmworkers in particular have fasted -- including Cesar Chavez's famous fast in 1968 (right), which drew global attention to the plight of California farmworkers -- as a means to underscore the urgent need for more humane labor conditions in the fields. The CIW's own organizing history is founded, in part, on a seminal hunger strike by six of its members, a month-long fast that stretched from December 1997 to January 1998. The fasting workers' only demand was for dialogue with Florida tomato growers, and though the growers refused to meet with the workers at the time, the call for dialogue drew the support of then-Florida Governor Lawton Chiles and former President Jimmy Carter. Despite the growers' rejection, the energy created by the workers' courageous sacrifice was not lost. Their 30-day fast sparked what would become today's Campaign for Fair Food, and twelve years later, Florida growers would not just sit with farmworkers in Immokalee, but agree to forge an historic partnership that is changing the very nature of farm labor relations in Florida (right, Jon Esformes of Pacific Tomato Growers shakes hands with Lucas Benitez of the CIW following the signing of the first of what would become industry-wide Fair Food agreements with Florida tomato growers). This coming month, workers from Immokalee -- men and women who put food on tables across the country -- will go without food again, this time to demand that Publix support that groundbreaking new partnership, that Publix support the fundamental human rights for farmworkers that are taking root today in Florida's fields thanks to the CIW's Fair Food Program. "The Sword That Heals" - Martin Luther King, Jr.
"Non-violence is a powerful and just weapon. It is a weapon unique in history, which cuts without wounding and ennobles the man who wields it. It is a sword that heals." The book is an invaluable glimpse into the pragmatic and philosophical reasoning that drove the Civil Rights Movement, a powerful justification of the challenging campaign of non-violent direct action that changed the conscience of a nation and tore down the structures of legalized segregation. It is a must-read. Half a century later, a decade of farmworker struggle first exposed, and then ultimately healed, the deep rift between farmworkers and their employers in Florida. Workers and growers, once profoundly divided, now sit together in a remarkably productive collaboration, building a new, sustainable Florida tomato industry that advances both the human rights of farmworkers and the long-term interests of growers through implementation of the Fair Food Program. That is why, today, the Fair Food movement looks to carry the torch of creative non-violence and to continue the fight for fundamental human rights. On March 5th, outside Publix corporate headquarters in Lakeland, Florida, fifty farmworkers and their allies -- faith leaders, students, and community leaders from across Florida and across the country -- will come together in a six-day fast, their sacrifice undertaken in the hope of raising awareness of Publix's role in blocking progress in the fields and expanding the rights of the farmworkers who harvest the nation's food. On March 10th, Day Six of the fast, Fair Food allies will converge on Lakeland for a protest at a Publix location followed by a 3.5-mile procession leading to Publix headquarters, where they will join the fasters in a ceremony to break the fast. There will be more details to come in the weeks ahead as we approach the date of the action. Publix has turned its back on farmworkers' rights for far too long. From their belated public response to the finding of forced labor in their supply chain, to their cold-hearted disavowal of responsibility for labor abuse on their suppliers' farms generally -- "If there are some atrocities going on, it's not our business" -- to their unconscionable indifference in response to the Campaign for Fair Food, Publix has stood in the way of progress long enough. The history of today's human rights movement is being written, in the fields -- and in the streets -- of Florida. Join us in Lakeland this March as we write the next chapter with the Fast for Fair Food.